It is pumpkin season! I love all things pumpkin and spice. 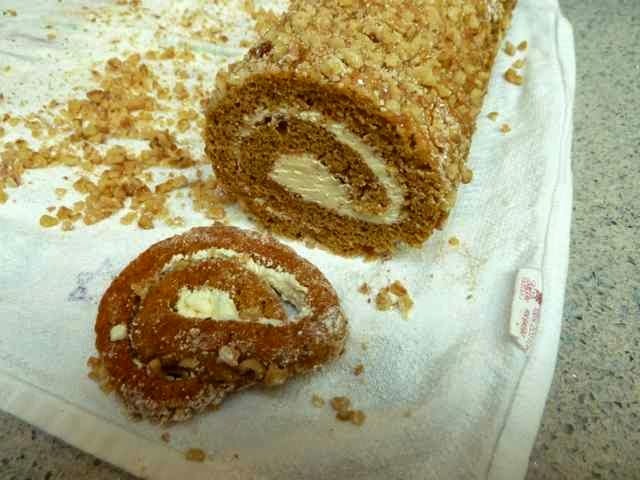 I took a wheat recipe for the roll cake and converted it into a GF one. 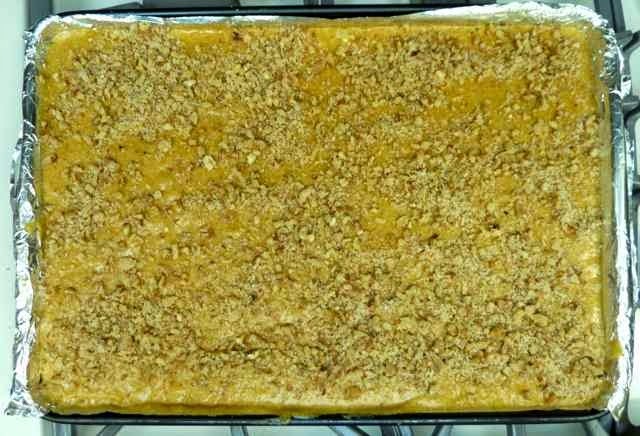 Then I decided that orange would make a wonderful filling and it turns out that I was right. 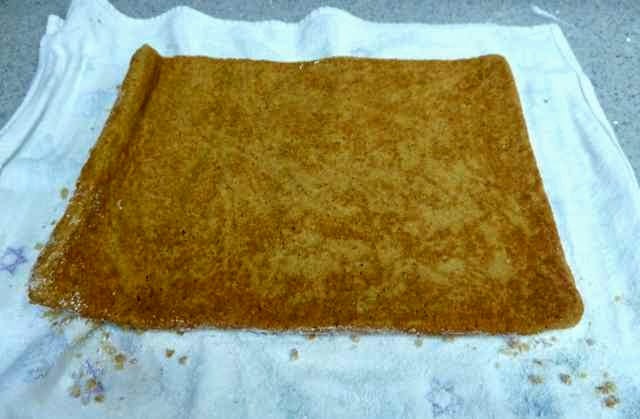 The cake has a soft and light sponge cake texture and is gently spiced. Totally yummy. I used whipped cream, but the orange cream frosting from my Spice Cupcake recipe would make a great filling as well. 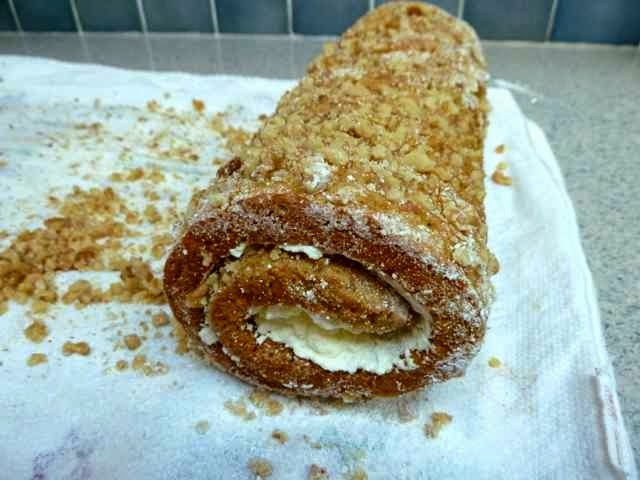 You could also use a cream cheese filling or frosting recipe, vanilla or orange. Not to unduly influence anyone, I must say that orange is a delightful pairing with the pumpkin cake. The cake itself is dairy free and my orange and orange cream cheese frostings have diary free directions. If you want a vanilla filling that is dairy free you can also try my vanilla frosting recipe. There is no fat or oil in the cake recipe. The pumpkin replaces these ingredients without sacrificing any taste, but saving some calories. 1/2 cup + 2 Tbs. 1) Add heavy cream to a small bowl. Whip with an electric hand mixer until it just starts to thicken. 2) Add the sugar and orange extract and continue whipping on high speed until soft peaks form. Do not over beat or you will have butter. 3) Place in the fridge until ready to fill the cake. 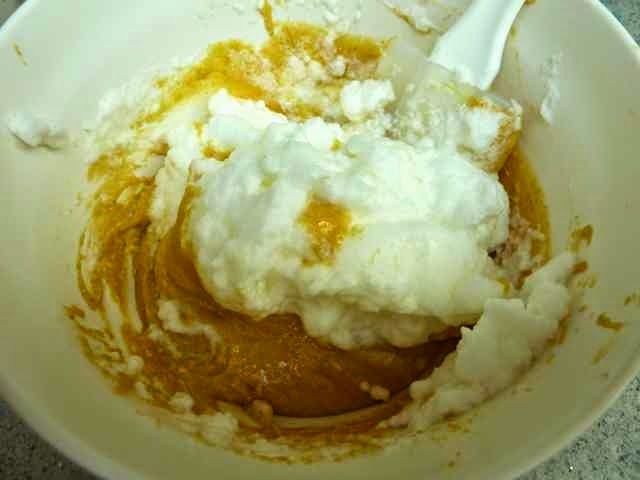 Vanilla Whipped Cream: use vanilla extract in place of the orange extract. Orange Cream Cheese can also be made Dairy Free. 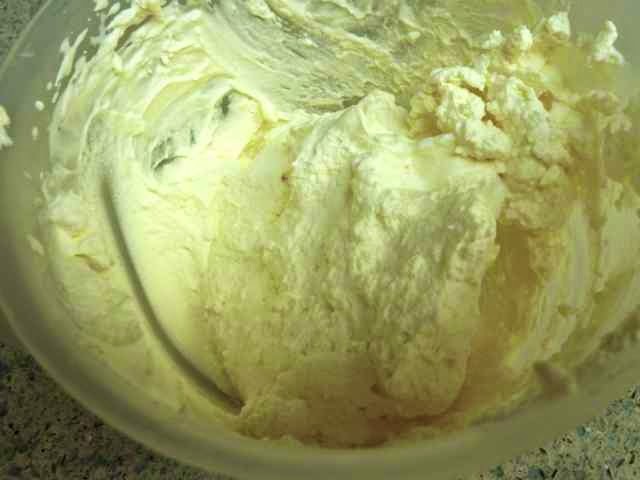 Vanilla Cream Cheese can also be made Dairy Free. Orange Frosting can also be made Dairy Free. Vanilla Frosting can also be made Dairy Free (recipe below). First make the cake. Preheat the oven to 375℉. Prepare a jelly roll pan (15” x 10”) by lining it with foil and greasing the foil well with butter or, for dairy free, margarine. Set aside. Jelly roll pan lined with foil and greased. 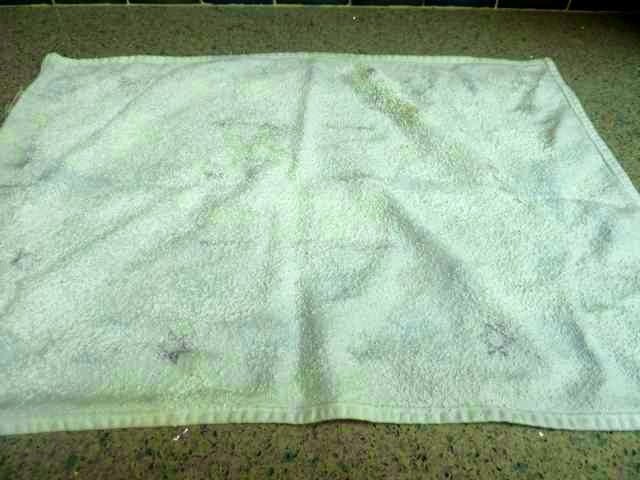 Prepare a clean dish cloth by laying out flat on the counter and sifting confectioners sugar evenly over the entire towel. Leave for later. 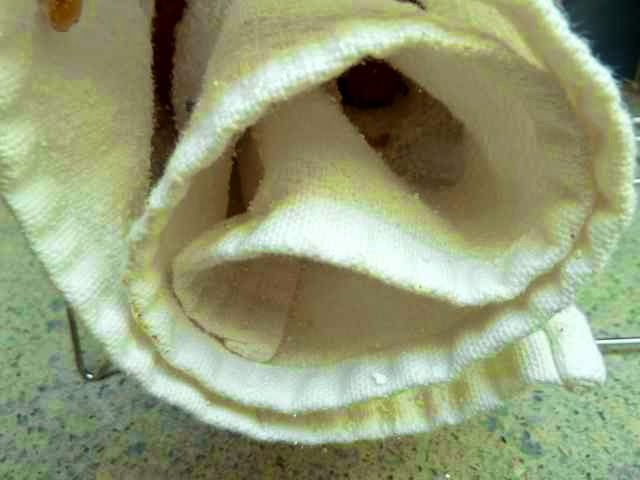 Dish cloth dusted with confectioner's sugar. 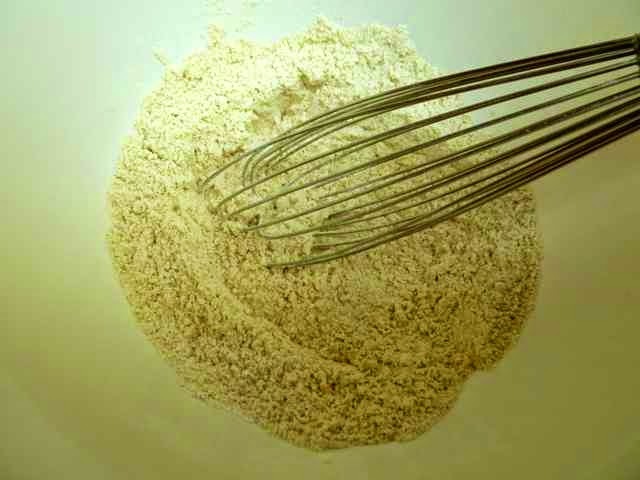 In a large bowl add all the flours, xanthan gum, salt, baking powder, baking soda and spices. Blend well with a hand whisk. Set aside. Dry ingredients whisked together well. 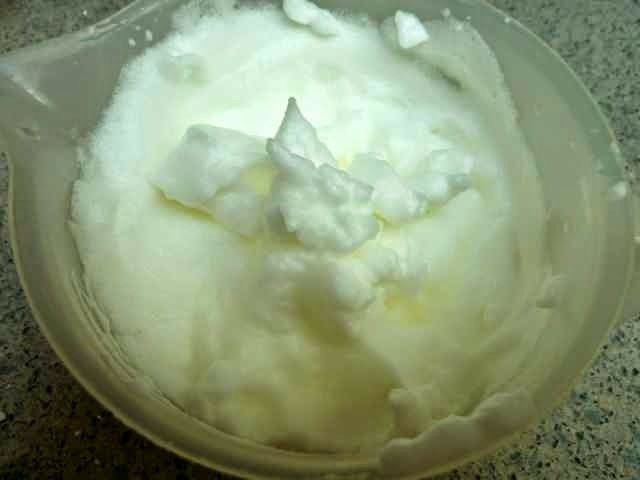 In a medium bowl with and hand mixer or in the bowl of a stand mixer whip the egg whites until stiff. Set aside. Eggs whipped until stiff peaks form. In a small bowl mix the egg yolks, pumpkin and vanilla. Pumpkin, eggs and vanilla extract mixed together. 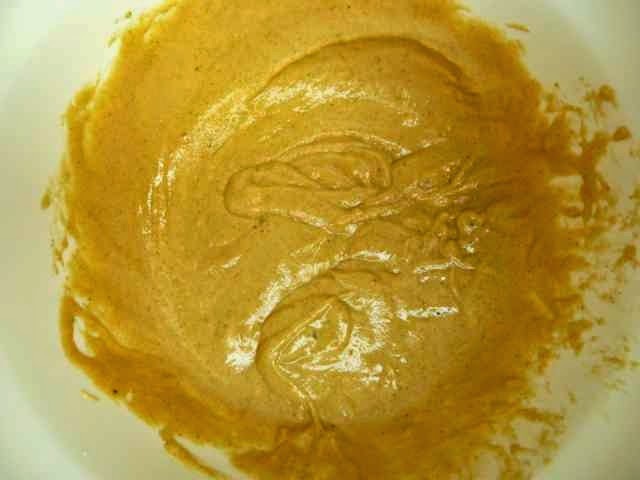 Add the pumpkin mixture to the dry ingredients and mix in well. 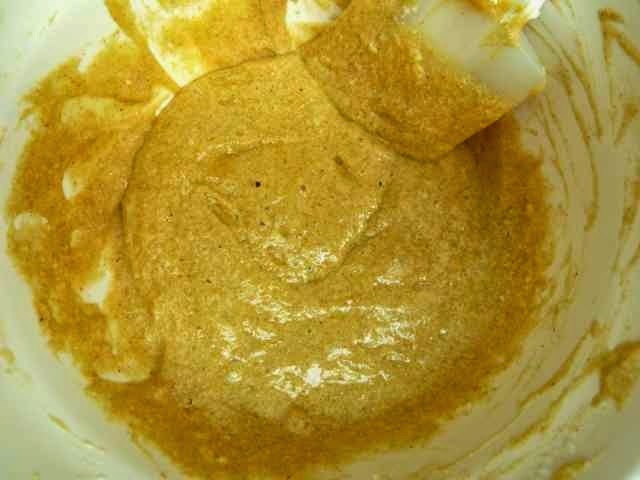 Pumpkin and flour mixtures well blended. Add 1/4 of the egg whites and mix in well. Fold in the rest of the egg whites with a large silicone spatula until the egg whites are incorporated. Break up any large pieces of egg white with the edge of the spatula if they are not mixing in. 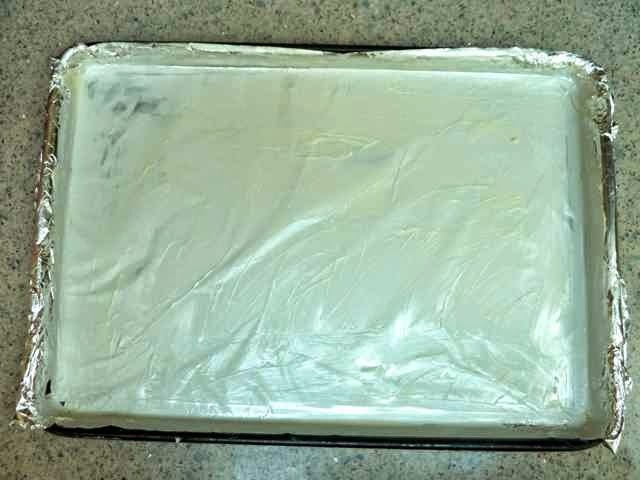 Batter after egg whites are all folded in. 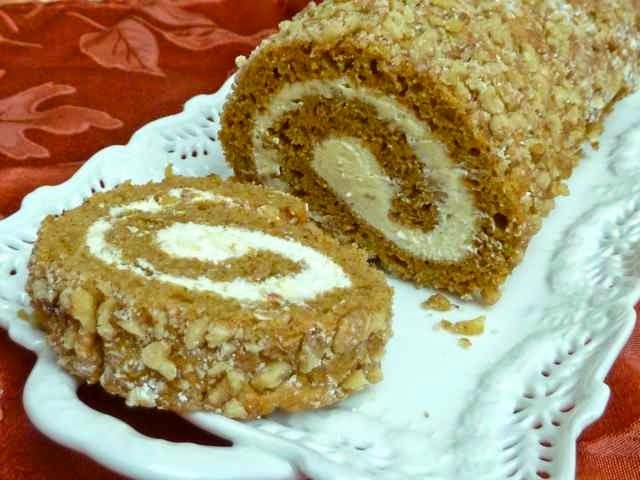 Spread the batter evenly into the prepared jelly roll pan. 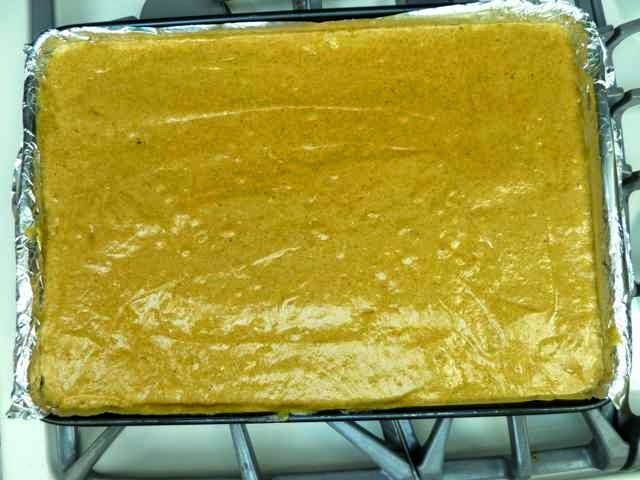 Raw batter spread evenly in the pan. 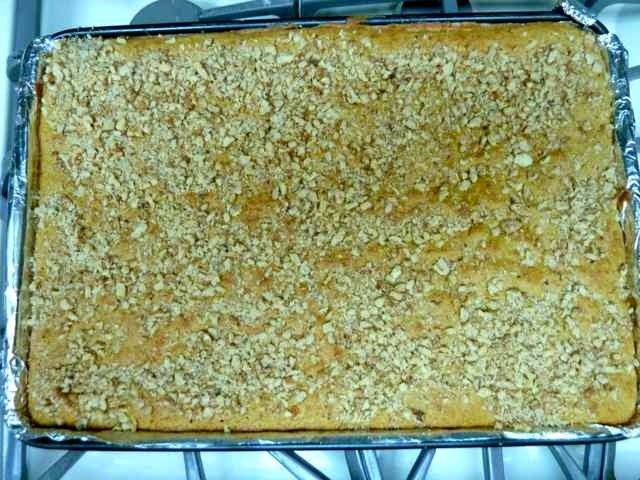 Sprinkle the chopped walnuts evenly over the raw batter. 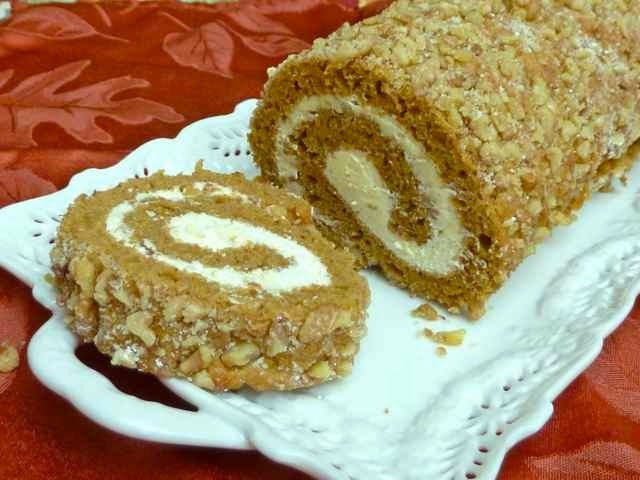 Raw batter with nuts sprinkled over the top. Bake 10-13 minutes (depending upon your oven) until the cake springs back when pressed gently with a finger. 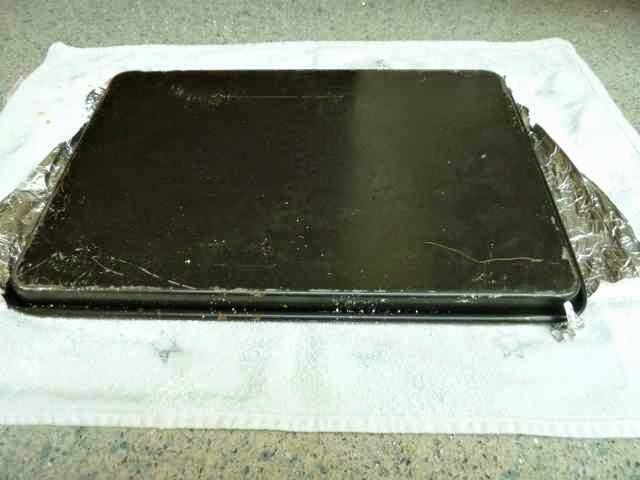 Remove the cake from the oven and immediately invert the pan onto the prepared dish cloth. Hot cake inverted onto the prepared dish cloth. Remove the foil by peeling it gently off of the bottom of the cake. Gently peeling the foil off. 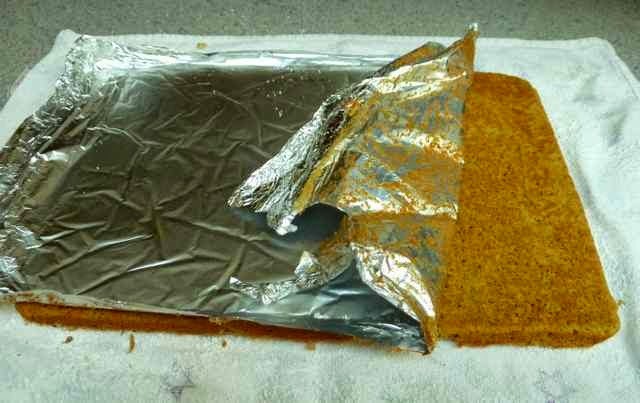 As soon as the foil is removed, roll the cake (and the towel) into a log. Start at the short end of the cake. 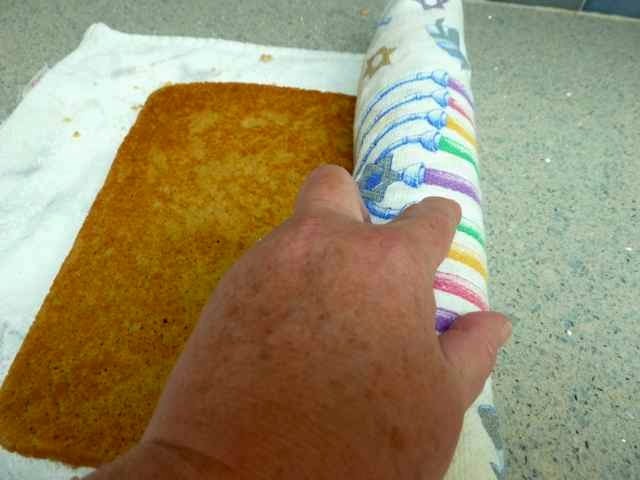 Rolling the cake using a dish cloth. Place the cake, seam side down, on a cake rack to cool completely. Cake rolled up in the dish cloth cooling on a rack. While the cake is cooling, prepare the filling of choice. 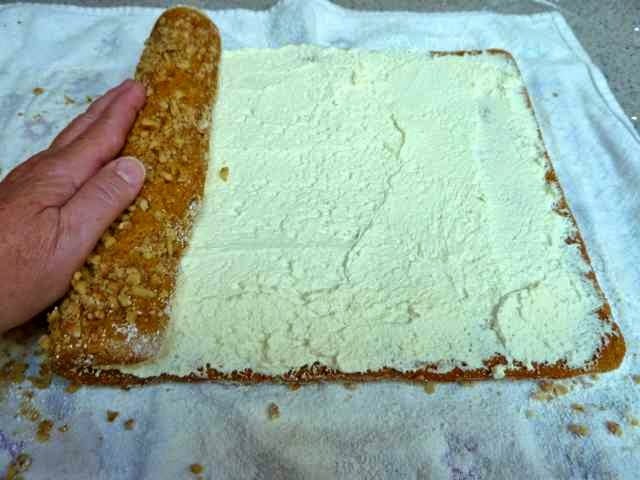 Assemble the roll when the cake is completely cool. Spread the filling over the entire cake, leaving the filling thicker at the center and thinner at the outer edge (so it rolls up and closes better). Gently roll the cake up again (leaving the dish cloth on the counter this time). Trim the edges if you want a more finished look (with the added benefit of a small taste). The edges can be cut off to make a nicer presentation. Place on a serving dish or platter. 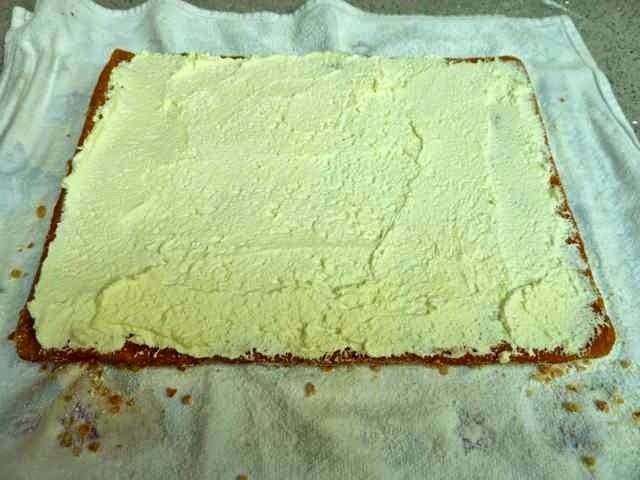 Keep the whipped cream cake in the fridge until ready to serve. Allow the cake to sit for half an hour to reach room temperature before serving and eating. Leftover cake will keep 3 - 4 days in the fridge. Wrap well and freeze the individual pieces or the entire cake for later use. Just thaw at room temperature before eating. Milk - For Dairy Free use dairy free milk such as Almond, etc. Add all the ingredients to a deep bowl. 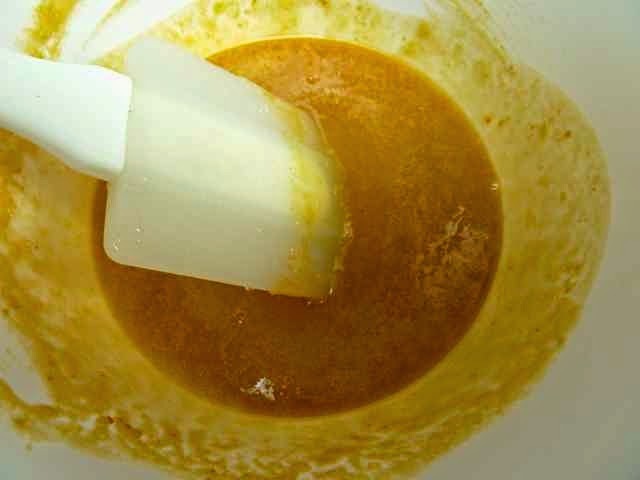 Mix with an electric mixer until well blended, smooth and fluffy.